For decades, we've been told that the best activity for burning calories and fat is aerobic exercise. In fact, you can practically pinpoint the year this idea started to take hold: 1977. That's when Jim Fixx's The Complete Book of Running was published. This bestseller popularized the notion of running to improve health and lose weight, and it's widely credited with kicking off the jogging boom of the 1980s. Hundreds of studies since then have reported that aerobic exercise offers many benefits, from improving markers of heart-disease risk to coping with mental stress to enhancing cognitive function. That's all good. But if you're looking to shed fat, the newest weight-loss research will tell you to look elsewhere for your exercise routine. "It's sort of like a self-fulfilling prophecy," says Jeff Volek, Ph.D., R.D., an exercise and nutrition scientist at the University of Connecticut. "Any type of exercise burns calories. So if you're told that running is ideal and you start dropping pounds once you take it up, then you have no reason to believe otherwise." The results: Each group lost nearly the same amount of weight—about 21 pounds per person in 12 weeks. But the lifters shed 5 more pounds of fat than those who didn't pump iron. The weight they lost was almost pure fat, while the other two groups shed 15 pounds of lard, but also gave up 5-plus pounds of muscle. "Think about that," says Volek. "For the same amount of exercise time, with diets being equal, the participants who lifted lost almost 40 percent more fat." 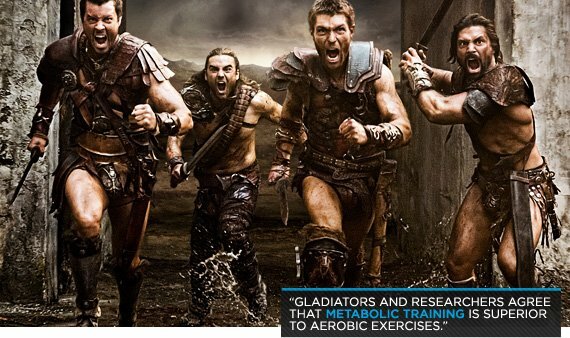 This principle is the basis for The New Spartacus Workout, which torches fat with high-intensity weight intervals. "Exercise physiologists often use the techniques for estimating the energy expenditure of walking and jogging and apply them to weightlifting," says Scott. "But clearly, aerobic and anaerobic activities differ, and so too should the way we estimate their energy expenditures." 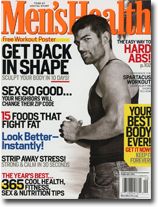 Scott's revelation is most certainly a relief to gym rats everywhere, who no doubt wondered why an intense, energy-sapping weight workout—like The New Spartacus Workout—supposedly burned so few calories. The unfortunate reality is that science is slow. "If we waited around for studies to tell us what works best for fat loss, we'd go out of business," says Rachel Cosgrove, C.S.C.S., who co-owns Results Fitness in Santa Clarita, California, with her husband, Alwyn, and created The New Spartacus Workout. Over the past 12 years, the Cosgroves have risen to the top of the fitness industry because of their clients' successes. From the beginning, their programs were scientifically based. "Starting out, we knew that weight training was necessary to avoid muscle loss, and that it appears to boost your metabolism for hours after you work out," Cosgrove says. "We also knew that according to studies, higher-intensity exercises such as interval training and weight training resulted in greater fat loss than lower-intensity exercise did." But from there, the Cosgroves started their own experiments. "As time went by, we began to drop aerobic exercise from our fat-loss programs altogether. And guess what? Our clients achieved even faster results," says Cosgrove. Keep in mind that the Cosgroves' clients aren't like Biggest Loser contestants. In other words, they don't have 4 to 6 hours a day to work out. "Our average client has to be in and out of the gym in 45 to 60 minutes and has only 2 to 4 days a week to exercise," she says. "We design workouts to optimize that time." That's why the Cosgroves rely on what they call "metabolic circuits." These are fast-paced weight-training routines in which you alternate between upper- and lower-body exercises—the basis of Rachel Cosgrove's latest plan, The New Spartacus Workout. You might compare this type of activity to running repeated bouts of 30- to 60-second sprints. While sprinting has been shown to burn calories at a high rate, it can't be sustained for long because the muscles in your lower body become fatigued—and that's even if you're resting between sprints. "But with metabolic circuits, you're emphasizing different muscles in each exercise," says Cosgrove. "So you can maintain a high- intensity effort for a much longer duration, and with almost no rest." The result: the muscle-saving, calorie-burning benefits of intense resistance training and sprints, combined with the nonstop movement of long, steady-state aerobic exercise. 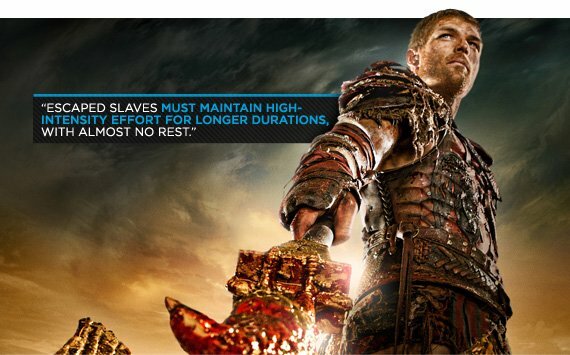 It could be the greatest fat-loss workout known to man—and it's the secret that makes The New Spartacus Workout so effective. Of course, if you try to find evidence of this workout's effectiveness in the scientific journals, you'll be disappointed: No one has studied it yet. But researchers like Volek and Scott are beginning to put the pieces together. Just as important, trainers like the Cosgroves are already using this kind of routine to help their real-world clients achieve faster results than ever. And isn't that what we're all looking for? 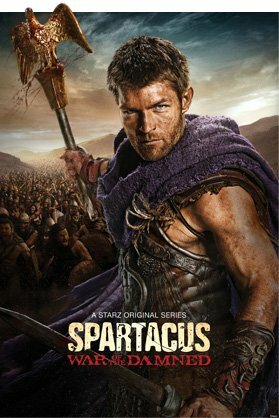 If so, click here to try The New Spartacus Workout!